Start off the new year on the right foot with this workshop on managing conflict in the workplace! Conflict in the workplace is unavoidable — especially in a leadership role. You can try and avoid it (which is not recommended), but you cannot escape it. The ability to recognize conflict, understand the nature of conflict, and to be able to bring about a quick resolution to conflict will serve you well. This 4-hour workshop will provide you with the skills needed to effectively manage conflict in the workplace. This workshop delves into the types of conflict we encounter in the workplace and provides practical guides for assessing and dealing with real life conflict situations. Applying existing tools and established processes, workshop participants will learn how to address conflict when it occurs and prevent conflict in the future, including how to be a respectful, neutral, and supportive moderator of workplace conflicts. This workshop is designed for supervisors/managers, HR professionals, or any other employee who finds themselves dealing with conflict in the workplace — whether it involves other employees or themselves. *Registration and breakfast will begin at 8:00am. The workshop will begin promptly at 8:15am. 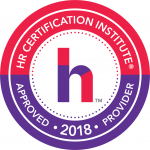 This program has been approved for 4 HR (General) recertification credit hours toward aPHR™, PHR®, PHRca®, SPHR®, GPHR®, PHRi™ and SPHRi™ recertification through HRCI. 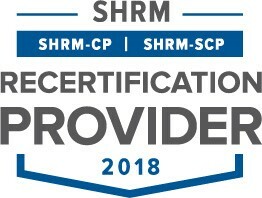 This program is valid for 4 PDCs for the SHRM-CPSM or SHRM-SCPSM.